The Epic of Gilgamesh 0 Edition Andrew George's "masterly new translation" (The Times) of the world's first truly great work of literatureMiraculously preserved on clay tablets dating back as much as four thousand years, the poem of Gilgamesh, king of Uruk, is the world’s oldest epic, predating Homer by many centuries. The story tells of Gilgamesh’s adventures with the wild man Enkidu, and of his arduous journey to the ends of the earth in quest of the Babylonian Noah and the secret of immortality. 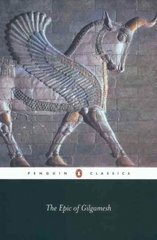 Alongside its themes of family, friendship and the duties of kings, the Epic of Gilgamesh is, above all, about mankind’s eternal struggle with the fear of death.The Babylonian version has been known for over a century, but linguists are still deciphering new fragments in Akkadian and Sumerian. Andrew George’s gripping translation brilliantly combines these into a fluent narrative and will long rank as the definitive English Gilgamesh.For more than seventy years, Penguin has been the leading publisher of classic literature in the English-speaking world. With more than 1,700 titles, Penguin Classics represents a global bookshelf of the best works throughout history and across genres and disciplines. Readers trust the series to provide authoritative texts enhanced by introductions and notes by distinguished scholars and contemporary authors, as well as up-to-date translations by award-winning translators.